Diego Simeone and his Atletico Madrid side continue to prove that solid defensive organisation and effective transitioning is just as, if not more effective than attacking flair in winning football matches. Simeone has beaten Mourinho, Ancelotti and now Zidane at the Bernabeu in his time as Atletico Madrid manager. There weren’t too many surprises in the starting XIs with Bale, Marcelo and Pepe being unavailable for Real while Atleti were missing Carrasco and Tiago. The starting line-ups. Real played in a 4-3-3 formation whereas Atleti used 4-4-2. Most of the game was played either in Real Madrid possession or in transition, with Atleti being as compact and defensively sound as usual while having occasional counter attacks where they would always go straight to goal, rarely passing backwards or putting their foot on the ball. In this analysis I’ll take a look at Real Madrid’s possession phase, highlighting Real’s poor attacking structure and Atleti’s brilliant defensive structure during said phase. Real Madrid, as expected, dominated possession however weren’t creative enough with the ball to score any goals or create many good chances, ending the match with an expected goals of just 1.1 (Via @MC_of_A) to Atleti’s 0.8. Aware of Atletico Madrid’s efficiency in transition which comes from their natural compactness, Real made sure that they did not create width to try to stretch Atleti until they had settled possession. In the first image, Real are only one or two passes after the turnover and they leave the flanks unused, wary of a possible counterpress from Atletico which would leave them vulnerable through the middle (Real themselves do also like to counterpress). The ball is played from Carvajal back to Modric and Danilo and Carvajal move into the flanks in an attempt to utilise the full width of the pitch to stretch the compact Atletico. Zidane was aware that Atletico Madrid are almost impossible to break down when they are defending in numbers (during this match it was often 11) in their own first quarter of the pitch. 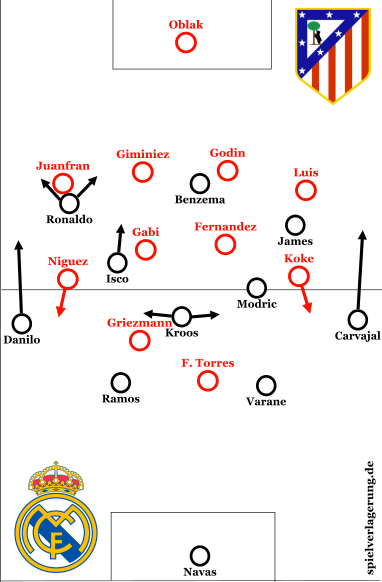 For this reason, a strategy that Real Madrid used to try to breach the Atleti back four was to pass from side to side in their own half, stretch the Atleti back four, creating 1v1s and then play long, vertical passes from around the halfway line over the top of the Atleti defence, aiming to utilise potential qualitative superiority in 1v1s that Real may have. Although a clever strategy, it was not very fruitful, below is an example of this. There is more space between the Atleti back four than they would like there to be, with Atleti’s semi-man orientation meaning that Luis is stuck tight to Ronaldo (who continually switched wings with James) following a passage of play on Real’s right flank. Modric plays a through ball for Ronaldo to chase however Luis manages to get the better of him. Even if they did manage to get the ball into the final third through this strategy, it was only in wide areas and Atletico’s excellent Uruguayan centre-back partnership of Giminez and Godin could cover effectively. I’m surprised Ronaldo didn’t move to centre-forward at stages in the game as they could have been more effective playing through him centrally; both over the top of the defence and in between the defence and midfield lines. To create this lack of horizontal compactness between Atleti’s back four, Real would double up in wide areas. As shown in the image, this would make Atleti less horizontally compact however this meant nothing as there was nobody to exploit the gaps between these players. Atleti’s midfield four would remain extremely horizontally compact anyway, blocking potential passing lanes into dangerous central areas. Another way in which Real Madrid tried to exploit the potential qualitative superiority of their forwards was by occupying Atleti’s back four with a man each, leaving them with no men spare to cover. It is typical of Real Madrid’s approach over recent years, arguably since the Galacticos project started, that they thought they could win this match via 1v1s and individualism. The stark reality was that, on the day, Atletico’s back four were just as strong man-for-man than Real were, meaning that this 1v1 strategy proved fruitless. Real also attempted to create overloads on one side of the field. This is a sound attacking strategy and may have been picked up by Zidane from his time working with Pep Guardiola for his UEFA Pro License. Real Madrid often struggled to get it into these overloaded areas quick enough however, and when they did, they didn’t utilise the overload with quick one-touch passing and clever movement, instead they often took too many touches of the ball (Ronaldo) and were too slow in moving the ball. Besides, the fact that they didn’t switch the ball into these areas with long passes, instead playing with shorter, slower passes meant that when the ball was in the overloaded area, Atletico’s defence were already compact and set up to defend against the overload. Benzema’s touch map-he was neutralised. To stretch Atleti vertically, Real Madrid would build up from deep and invite pressure from Atleti’s front six. This would, of course leave lots of space in between Atleti’s back four, who like to maintain a medium line, and midfield four. Real Madrid’s lack of no. 10 in the 4-3-3 formation they used meant that they couldn’t exploit this space in between the lines, with Benzema also rarely dropping off into this ten-space. Benzema’s touch-map shows that none of his sixteen touches in the match were in the vital ‘Zone 14’ area. This, my final image showing Real’s decent attacking structure at times, shows Real with men in between the lines in a 3v2 overload, a scene reminiscent of a Guardiola side. Again, however, the problem is that they were too slow to get the ball into feet in this area, and when they did they didn’t exploit the overload, with one player hanging on to the ball for too long and no penetrating runs being made. Real Madrid now have 5v4 on the last line of attack however they are in a flat line which makes them ineffective. Atleti’s vertical compactness and Real’s lack of pivot here means that the ball can only feasibly be played to one of the two widest players of the five. The Atleti defence will simply shuffle across and Real’s lack of passing triangles will mean that having these five players so far high up the pitch is completely pointless. This shape allows Atleti to control central areas, and means Real have no way of penetrating Atletico’s back four. Real offer no central penetration. forced Real to make 27 crosses in the game. The majority of these crosses were well-defended by Giminez or Godin, with only a handful of efforts on goal coming from crosses into Ronaldo or Benzema. As you get closer to the opposition’s goal when in possession, the space in between your players should be smaller and the passing should be quicker and sharper. As we can see above however, Danilo receives the ball on the flank in the final quarter and is completely isolated, with his only option being a pass backwards to Kroos who will be pressed by Griezmann. This was typical of Real’s poor geometry and positioning in the final quarter. Atletico Madrid again showed why they are the most defensively tight team in Europe. They were happy to sit back often with 11 men behind the ball (as shown below), soak up Real Madrid’s weak possession, and then counter attack through Griezmann. They by no means outclassed their cross-city rivals however they demonstrated that you don’t have to spend hundreds of millions of Euros to compete at the highest level in the world. 11 men behind the ball. Atletico Madrid had no qualms about defending this deep with 11 players behind the ball. They would be extremely spatially compact with minimal space between each player. The back four more or less maintained the same shape just insdie the penalty area however the midfield four and front two would shuffle across to where the ball was to make sure Atleti always had at least one man spare in the immediate area to the football. Atletico’s defensive organisation doesn’t just behind when they have their backs to the wall around their own penalty area however. If Real Madrid have good access to options, that is to say the ball carrier isn’t stranded with the ball inside his own penalty area, then they will put little to mediocre pressure on the ball, just enough to make sure the Real centre-backs don’t have an aeon to find an accurate long pass into the forwards. The aligned image shows how Atletico have moved into a 4-1-4-1 (ish) shape to have one man (Torres) pressuring the ball while they have a horizontally compact line of four blocking access into Real Madrid’s intelligent and creative midfield three of Kroos, Modric and Isco. Forcing Real into the flanks via their less creative full-backs, Danilo and Carvajal was a successful strategy. 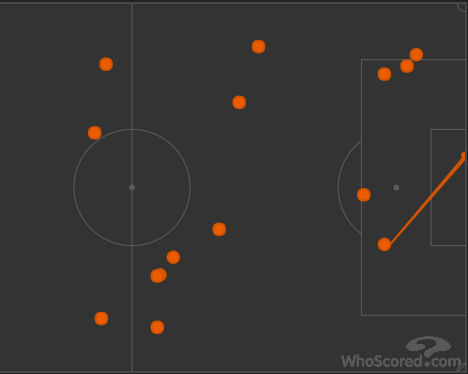 Atletico spatially dominated the centre of the pitch all match. To the right is a scene during the match which I thought best showed Atletico’s fantastic defensive play in Real Madrid’s half. 2/Niguez immediately gets to the man on the ball while Torres moves over to prevent the pass backwards. Real are forced up the wing. 3/ Real have the ball on the touchline, meaning the player has 180 degrees of his potential playing area cut out. He is tightly marked from behind, preventing his ability to turn, and is pressed from two ways. 4/He can only play back to the player he received the ball from, this player cannot make progress up the flank as Atleti have delayed Real enough to be able to shuffle their players over into their right flank and halfspace to make it overloaded and impenetrable. Real have to switch. 5/As the ball comes back across to Varane, Atleti have good ball pressure and a compact central block, with their main aim, as ever being to prevent Real access the central areas and their three creative midfielders that are in this area. 6/ The ball is played to the flank and has to be played as a long vertical pass upfield. 7/ As the pass is so long, Godin just has to anticipate what shoulder of the player the pass will be played to, and can come from deep, using his left shoulder to cut in front of Benzema and intercept the pass brilliantly. Long, ground-level passes are extremely difficult to control and keep hold of if Godin is marking you, even if you are a proficient player in hold-up play like Karim Benzema. In summary, the above example brilliantly demonstrates how, even though Real Madrid have the ball at their feet, Atletico Madrid are in control of the game. Atleti force them into areas they are comfortable with, stop them from accessing the centre of the field, and then force them to play risky passes where Atleti can use their brilliant 1v1 defending abilities to intercept. Finally, an example of Atleti in their own half forcing Real Madrid wide. They have created an arrow head formation, completely restricting central passes, and have a midfield line of three, just in front of the back four who are blocking potential ten-space. The wide players in this midfield three also have proximity to press the players out wide should they receive the ball. The ball is played wide to Danilo, he is completely isolated due to Real’s dreadful positional play, and is forced down a blind alley where Niguez can retrieve the ball from him. Atletico Madrid controlled the central space with their superb defensive structure and organisation, thus controlling the game itself. They weren’t hugely dangerous when attacking however did manage to get the winning goal through arguably the best move of the match. They are easily good enough to win La Liga and probably would if it wasn’t for the record-breaking Barcelona side they are up against. Real Madrid clearly have some work to do although any team in the world would struggle against this Atleti defence. They need to improve their attacking structure and passing tempo if they expect to beat some of Europe’s best sides in the Champions League, the tournament they should prioritise from here on in. I highly appreciate your knowledge and your effort. It is telling that the international version of spielverlagerung reflects the excellence of the German one. I’m looking forward to witness a rising popularity of this site. Keep of the good work! Fantastic article, I especially enjoyed the structure and “angle” of your piece. Whether it’s down to choice or insight, but its rare to see a football writer highlight such fundamental themes or ideas and connect dots in a logical manner, thus demonstrating a deep understanding of the dynamics of a football match. Thank you very much. Thank you. I try my best to deliver an analysis at the nearest possible to the highest level of my understanding (however high that is?! ), something different from the mainstream media.